Panteli in Leros. Beaches. Restaurants. Accommodation. Panteli, or Pandeli, was love at first sight for me. We arrived by hydrofoil to Agia Marina without knowing where on the island we would stay. Once ashore we jumped into the first taxi we saw and asked the taxi driver to drive us to the island's best village. The taxi drove at high speed from Agia Marina up to Platanos, and then down to Panteli. Even before we went out of the taxi we realized that Panteli was a village in our taste. When we had arranged our accommodation we went down to the beach and sat down at a taverna. We enjoyed what we saw. When the food was served, we were amazed, it was the most delicious food that we had ever eaten in Greece. This must be paradise, we said to each other. It is many years since we came here the first time. The village has changed a lot since then, but fortunately just for the better. 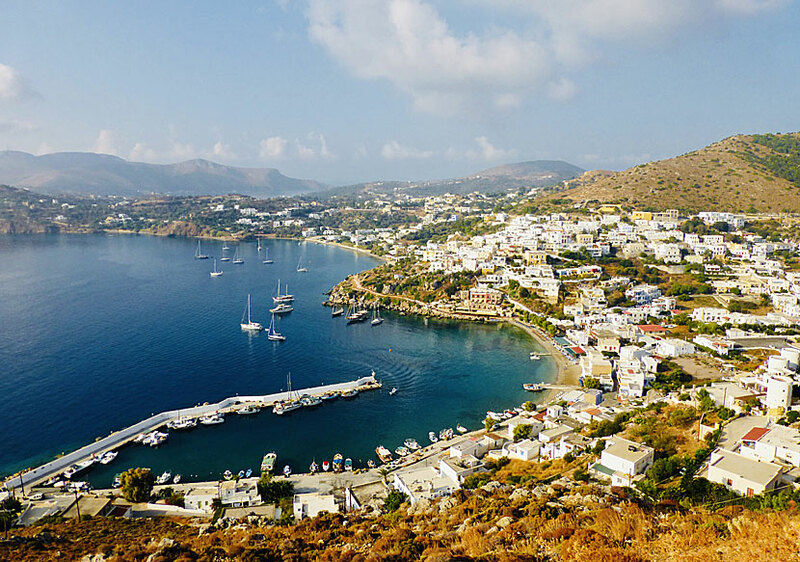 An overview of the village is on the first page of Leros. View of Panteli, Spilia and Vromolithos. The picture above is photographed from Kastro. To the left we see a breakwater and a marina, if we follow the quay to the right we come to a small beach, behind the beach lies some small houses. Panteli is not lager than that. The village we see above Panteli is Spilia, and after Spilia lies Vromolithos. I think that Panteli is a perfect holiday resort. All I wish for is within crawling distance: accommodation, beach, marina with fishing boats as well as cosy cafes and restaurants. If I want to stretch my legs, it's walking distance to Platanos, Spilia and Vromolithos. The only thing I previously lacked in Panteli was a shop with good supply, but it exists since the summer of 2018. I also like that the village is so small and compact. Something you do not believe when you see the village from above from the Kastro in Platanos. Panteli is so ideal that one do not need to go anywhere else. At least we do not need to. The days in Panteli usually have the same routine for us. First we enjoy a long and peaceful breakfast. Then we go for a swim. It is so close so we do not need to bring change of clothes. Afterwards, we usually sit on the balcony and read a book. When it's time for lunch, we jog along down to the beach and sit down at one of the tavernas. Which one does not really matter because everyone is good. After the siesta, we may go for another swim, or read some more books. In the evening we go to the marina and look at the fishing boats. Then we follow the quayside back to the beach, where we sit down and take an ouzo before dinner. If you think it sounds nice, you will also love Panteli. One of many good restaurants in Panteli. Evenings in Panteli is magical. 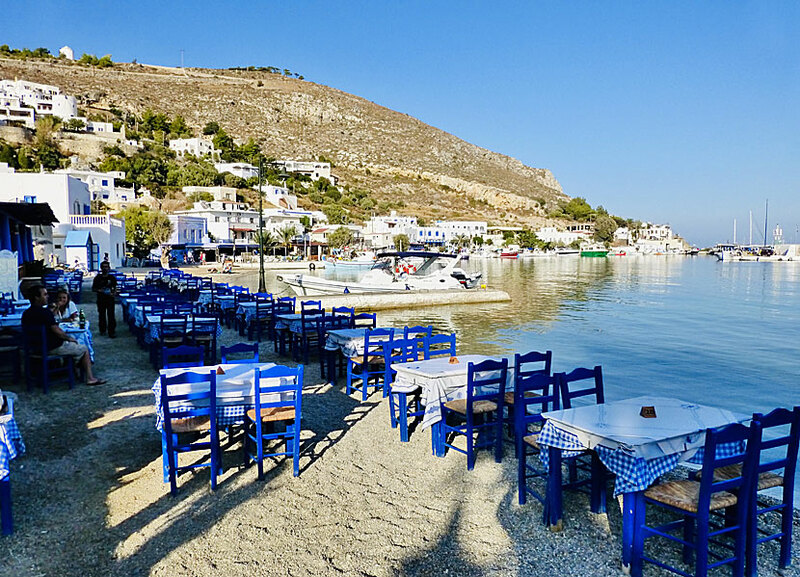 The tavernas set out tables and chairs on the beach, one can not get closer to the sea without sitting in the water. 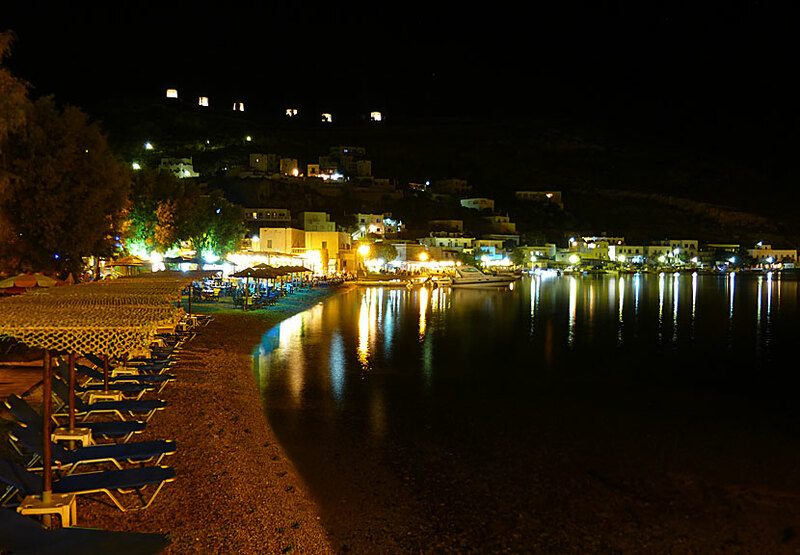 When darkness falls, the beach is illuminated by light from the tavernas. If one look up towards Platanos one see the impressive castle and the six windmills bathe in light. It is so beautiful! We have eaten at all the tavernas in Panteli and we have eaten good food every time. To choose a favourite is difficult. But if I have to mention some, I choose Psarapoula (Apostolis) and Zorbas located next to each other about in the middle of the beach. Do try some of the other tavernas too. You will not be disappointed. 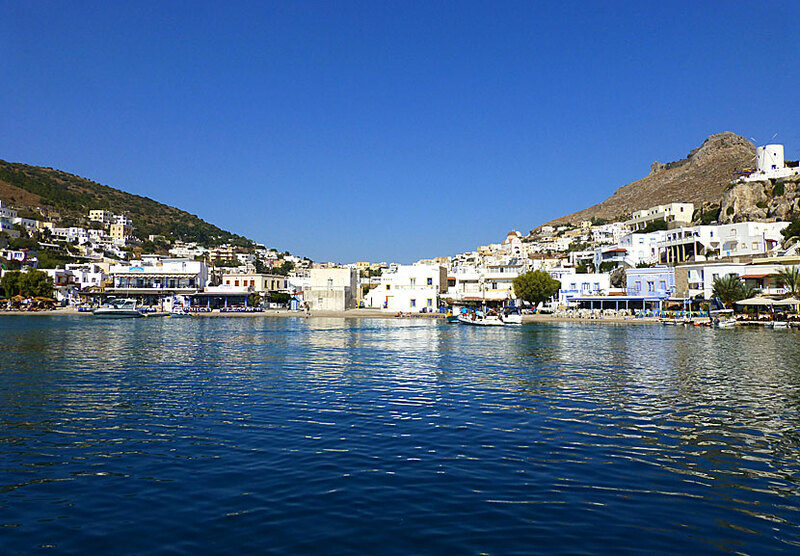 We have stayed overnight in Panteli for three times and will probably stay there the next time we travel to Leros. Alinda is also nice, but Panteli is better. At least that is what I think. Last time we were here we stayed at Panteli Beach Hotel, and it is one of the best accommodation we have had in recent years, and I can heartily recommend it. Asterias are also very good.